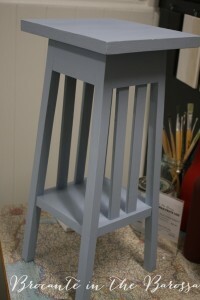 We are experimenting here in the boutique with the colour range of Chalk PaintTM decorative paint by Annie Sloan. 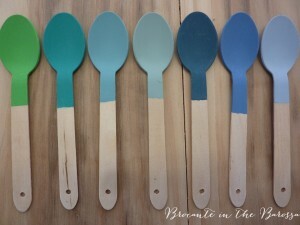 All the colours are beautiful, but lately we have painted a number of pieces in some of the gorgeous blues and greens. Here is a tour of a selection of them. 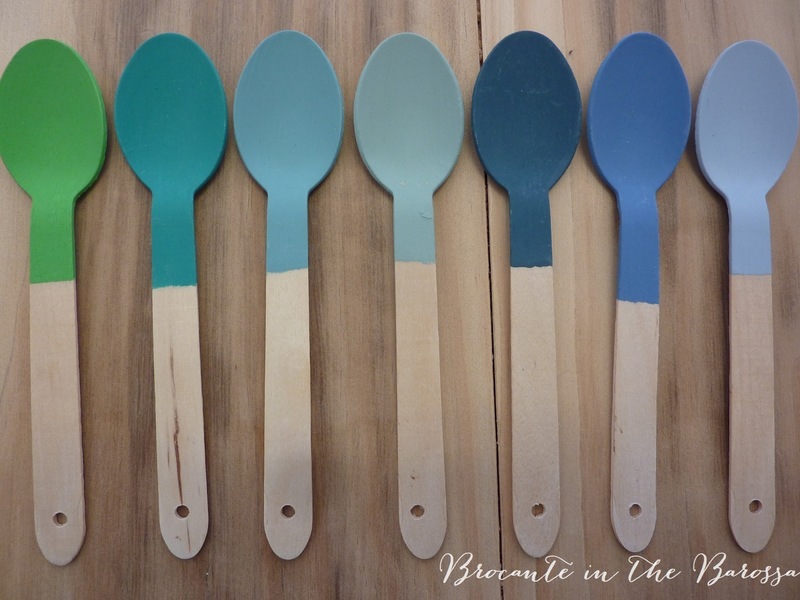 We are painting up some small timber spoons, as samples to show of the pretty colours. Shown here are from left to right, Antibes Green, Florence, Provence, Duck Egg Blue, Aubusson Blue, Greek Blue, and Louis Blue. Here on right, a really nice vintage chair has been painted in a light undercoat (Versailles), then given an all over coat of Aubusson Blue, a vivid blue with a warmth to it. It has been distressed lightly and then a deep coppery green colour called Florence has been pushed over the distressed parts. 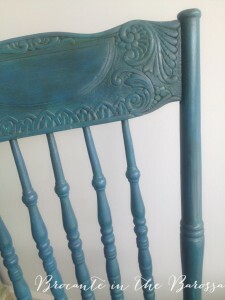 The entire chair has a waxed finish, with clear waxes and a very light hand of dark wax to highlight the carved details. The colour is now reminiscent of deep teal one sees in sun shining on ocean waters in small bays or inlets. 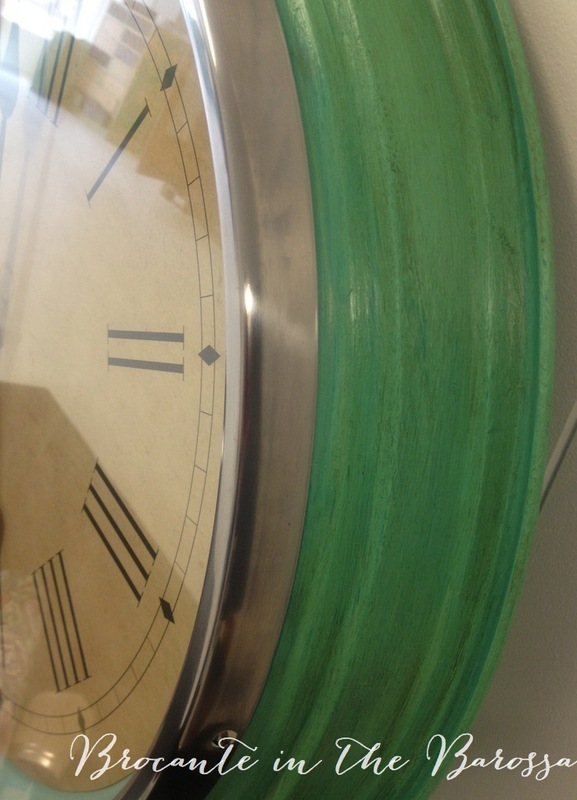 Florence is used here to makeover an enameled metal framed clock (left). The base coat is Florence and over that is a coat of Florence mixed with a good dose of Antibes Green for brightness and a smaller amount of Old Ochre to tint with some richness. The mix of these three is dragged across the Florence base coat before it was completely dry, mixing it in together. 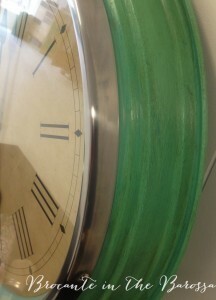 The painted finished is waxed in clear and dark waxes, to give a richer verdigris coloured finish. I wasn’t sure I liked Louis Blue so much, just looking at it from a swatch on the colour chart. Until I painted this little table (right). The table was sturdy though a bit abused, with its varnished finish covered with water rings on top. Several coats of Louis Blue set that right and it came up sweet indeed. This got lightly distressed on edges, then clear wax. Louis Blue is a bit more sophisticated than baby blue. It has a nice intensity that gives it a personality that is more than just pastel. I like the hint of periwinkle in it too. Very easy on the eyes and gets on well with others, Louis Blue just might be one of my new fave colours ! This old dresser had heaps of charm, but it had endured some rough knocks in its life (left). First, it is a bonafide antique, estimated to be 100-110 years old. However, its issues were rather serious, as it was moved about probably more than once or twice with the mirror attached and it had suffered cracks in its shelf and more. It took real restoration to repair the damages properly. Then it had to have a paint job (because the timber repairs were very obvious, even if skillfully done. 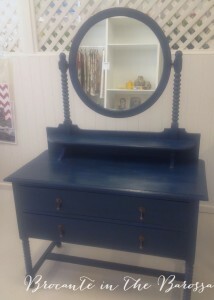 With some deliberation, we decided this piece wanted to be dark blue. It got several coats of napoleonic Blue, which the old timber drank in readily. Then clear and dark waxes. A new mirror was fitted to replace one that had damaged edges. And it was happy to wear its original brass drawer pulls. 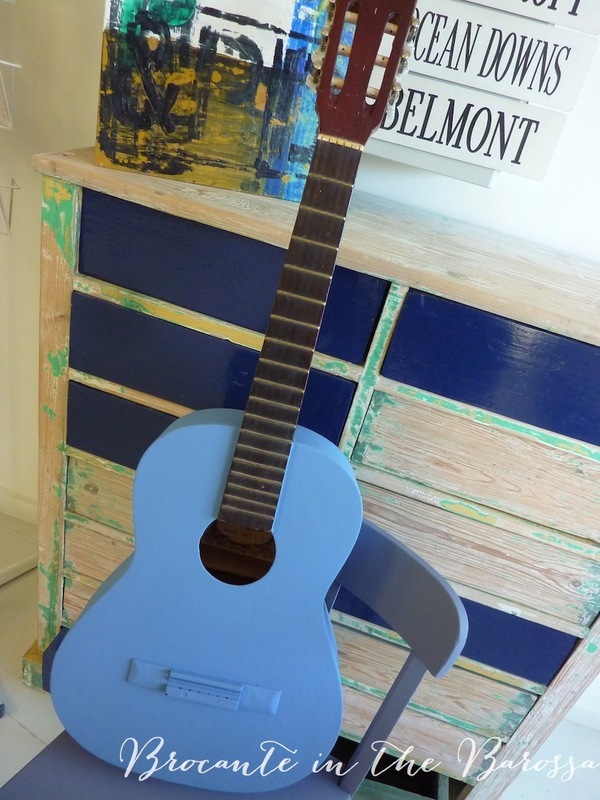 An old used guitar, right, got a smashing new finish in glowing Greek Blue. Why did I buy an old guitar from one of our suppliers of old vintage furniture ? Well, a bit of symmetry really. It is a stunt double of one I bought over 20 years ago in Mexico and brought back for my son. After he admired it for years for its decorative value, he took up music and he is now a performing musician. And, besides–I always wanted a blue guitar !